WHAT IS LARGE-FORMAT DIGITAL PRINTING? output device. Large format printing generally refers to output larger than tabloid sizes, or about 11×17. At NDS, large format usual means 22×28 inches to billboard sizes. result, offset printing requires substantial setup and the costs of this setup must be distributed among the quantity of printed materials. For process color printing on 11×17 paper, quantities of 1000 or more must be ordered before the cost per print begins to be linear versus quantity. Larger sized output requires less common and more expensive printing presses and film, driving up minimum order quantities substantially. Digital printing is cost effective in low quantities, with little or no tradeoff in quality. Large format digital printing can be used whenever traditional printing techniques is cost prohibitive because of quantity or unnecessary extreme quality. Some applications are posters, displays, signage, point-of-purchase displays, banners, fleet graphics, murals, billboards, custom fabric, wallpaper…etc. A 6 color CMYK +LC +LM or 4 color CMYK do not match SWOP inks exactly, so output is not identical to what comes from offset printing. Pantone color matches are not guaranteed, but the color range NDS can reproduce is within 95% of the CMYK Pantone standards. WHAT QUANTITIES ARE COST EFFECTIVE? With the higher printing speeds and multiple printers, quantities of up to 200 are now cost effective, depending on sizes. WHAT COMPUTER PLATFORMS DOES NDS SUPPORT? 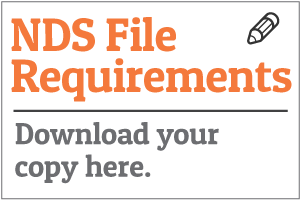 NDS uses Macintosh workstations but can accepts PC or windows files as well. WHAT SOFTWARE DOES NDS SUPPORT? We use Adobe Illustrator, Photoshop, Acrobat, Freehand and Corel Draw. HOW LARGE CAN NDS PRINT? HOW DOES LAMINATION EFFECT COLOR? prevent unwanted glare (important for trade show exhibits or backdrops being used on television or camera) but do not enhance color. Depending on the substrate used and extreme environmental conditions, NDS output can last indefinitely under indoor conditions. Outdoor applications, such as billboards and banners, can last several years, depending on finishing options like overlaminates. NDS works mainly on a wholesale level, printing for many local companies, ad-agencies, fast food chains, banks, etc… We do our best to maintain up to date with equipment and materials so as to help our customers with everyday production needs. We prefer all artwork to be supplied as high-resolution PDF format. PDF’s are the standard file format for large format print but it is important to ensure they are prepared in the correct way.Ensure that you choose the High Quality Print or Press Quality from the adobe preset menu. Please also ensure that fonts are either embedded or converted to outlines.